Heyyyyy guys! I found out some pretty cool information that I want to share with you all! One of mt favorite cosmetics company Makeup For Ever is hosting its very first open casting call to find a new face of the Unretouched Ad Campaign! The open casting call starts January 2nd through February 1st, 2012 ( know I am a couple of days late posting the information…sorry). To enter, you must create a picture-perfect make up look and submit the photo through a dedicated microsite, www.hd.makeupforeverusa.com. All finalists’ photos will be featured in a photo album on the MAKEUPFOREVERUSA Facebook page. The winner will be announced on Facebook on February 9th, 2012, and then flown to New York City for a professional photo shoot. The casting call is open to all women age 18 and over residing in the U.S. and Canada. 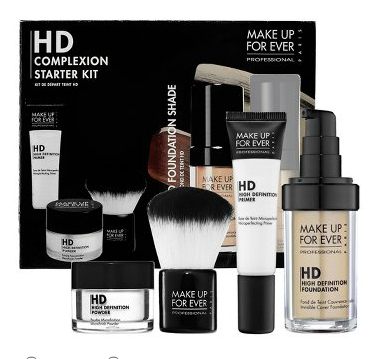 The winner will be featured in an advertisement that highlights MAKE UP FOR EVER’s new HD Complexion Starter Kit. . The kit includes 4 of Makeup For Ever’s most coveted products. The HD Microperfecting Primer, HD Invisible Cover Foundation, HD Microfinish Powder and a Kabuki Brush, all of which were created to be used in front of unforgiving high-definition video cameras and provide results so flawless that the need for retouching is unnecessary. To find your perfect foundation shade, Makeup For Ever has created a shade finder tool that will help you find the perfect foundation match. Visit http://hd.makeupforeverusa.com/#shade_finder for the shade finder. Makeup For Ever’s HD Invisible Cover Foundation is available in 26 different shades to match all skin tones. The HD Invisible Cover Foundation provides oil-free, medium-to-full-coverage that creates a soft-focus effect to soften lines and blur imperfections and not to mention, it is their best-selling product. So, head on over to the Make Up For Ever site and enter! Who knows…you could be the winner!